More organizations are embracing a data culture that unifies information from many sources to drive business decisions. For a data-centric culture to thrive, it requires everyone to work from the same data platform, and intuitive tools that let them leverage vast quantities of data quickly to reach insights. The Power BI updates we’re announcing today help organizations unify their enterprise BI needs on one platform and empower business analysts to leverage data more easily. Starting in July, these capabilities will begin to appear in Power BI in preview. I recently discussed the challenges associated with analyzing large volumes of data – specifically ingesting, integrating and analyzing disparate data. Data preparation and modeling are key components of the data journey, and our customers tell us that these activities often account for the majority of the time users spend working with data. We’re investing in capabilities that reduce the time it takes for business analysts working with data to get insights. Self-service prep for big data – We’re expanding self-service data prep in Power BI by introducing new capabilities to help business analysts extract insights from big data. Using the Power Query experience familiar to millions of Power BI Desktop and Excel users, business analysts can ingest, transform, integrate and enrich big data directly in the Power BI web service – including data from a large and growing set of supported on-premises and cloud-based data sources, such as Dynamics 365, Salesforce, Azure SQL Data Warehouse, Excel and SharePoint. 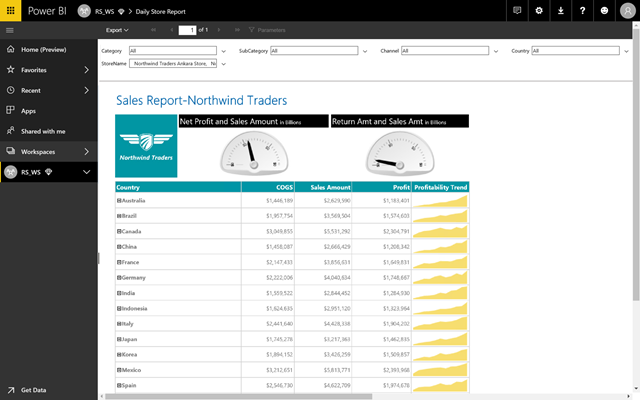 The ingested data can now be shared across multiple Power BI models, reports and dashboards enabling easy data reuse. Advanced analytics and AI with Azure – Additionally, it’s important that all of the users throughout an organization operate on the same data. We’re fueling collaboration across roles by unifying access to data between Power BI and Azure Data Lake Storage Gen2. Business analysts can seamlessly operate on data stored in Azure Data Lake Storage taking advantage of its scale, performance, security and analytics with the self-service capabilities in Power BI, while data engineers, data scientists and other users can extend access to insights with advanced analytics and AI from complementary Azure Data Services like Azure Data Factory, Azure Databricks, and Azure Machine Learning. For example, data engineers can add, enrich and orchestrate data; data scientists can build machine learning models; and business analysts can benefit from the work of others and the data available in the Azure Data Lake Storage while continuing to use the self-service tools in Power BI to build and share insights broadly. Support for the common data model – Power BI will also support the common data model, which gives organizations the ability to leverage a standardized and extensible collection of data schemas (entities, attributes and relationships). Users can take advantage of a standard schema – or customize based on their unique needs – to simplify how they enrich their data with other sources from Microsoft and third parties to accelerate analysis across a broad, unified dataset. Just as managing data from multiple sources can create challenges, managing multiple BI platforms within an organization can limit centralized access to insights. Moving to one modern, compliant platform as the single destination for business analytics is easier than ever with key enterprise-facing updates on Power BI. Enterprise-scale BI models & application lifecycle management (ALM) – We’re taking another step to bring advanced capabilities from SQL Server Analysis Services into Power BI, enabling larger data volumes, lifecycle management, and third-party BI tool connectivity. Incremental refresh, higher dataset size limits, and aggregates will allow customers to reach large dataset sizes, while maintaining fast and fluid reporting end users expect. With new support for the XMLA protocol, existing Analysis Services tools for managing lifecycle—from deployment through operations can now work with Power BI datasets. Additionally, since many third-party BI tools support XMLA, Power BI can now fuel analytics for all users across your enterprise, regardless of which reporting tool they choose to use. Enterprise reporting – Popular SQL Server Reporting Services technology is now part of Power BI, creating a unified, secure, enterprise-wide reporting platform accessible to any user across devices. Pixel-perfect paginated reports can now be included alongside Power BI’s existing interactive reports. Multi-geo compliance – New flexibility to deploy Power BI Premium in specific global regions so organizations can meet data residency requirements and improve performance of data loading by locating Power BI close to data sources. Three years ago we launched Power BI to create new opportunities for businesses to drive a data culture where all employees, regardless of role and skillset, can access the insights and intelligence they need to make smart decisions based on facts. Today, Power BI supports 43 languages and is used by customers in more than 18,000 cities. More than 19 million data models are hosted in Power BI and over 8 million dashboard queries are processed each hour. Thank you to our users for being part of this journey, and for the vibrant community that helps shape the product. Learn more about these latest updates during Microsoft Inspire at the Power BI session, and for a deeper dive, join us at the Microsoft Business Applications Summit in Seattle on July 23 where you will learn more about these capabilities and see them in action. Register now for the Microsoft Business Applications Summit if you haven’t already! Tilmeld dig nedenfor for at modtage de seneste nyheder fra Power BI direkte i din indbakke. Ved at klikke på Tilmeld dig i dag giver du dit samtykke til, at Microsoft må sende dig Power BI-nyhedsbrevet med eksklusive nyheder, undersøgelser, tips og råd og andre oplysninger for at sikre, at du får mest muligt ud af Power BI. Du kan framelde dig når som helst. Microsofts erklæring om beskyttelse af personlige oplysninger.